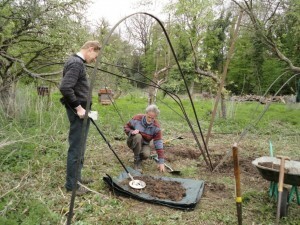 Martin, Simon and Gill went to the Round Garden at Cliveden to look for metal tree tags (to help identify which varieties of apple and pear trees were grown), and to investigate what structure was at the centre. Simon checking earth dug out from the centre for metal. Simon and Martin straightening hoops. The concrete hole in the middle of the Round Garden. A wooden pole was probably set into the concrete. Steel hoops radiating out were attached to the top. 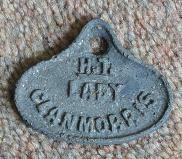 A tag for the Lady Clanmorris hybrid tea rose. 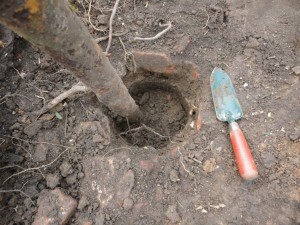 This suggests that roses were grown at the centre of the Round Garden. 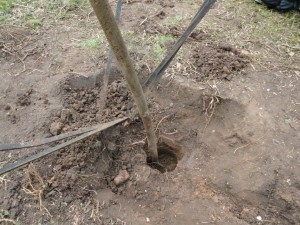 The apple and pear trees also had metal tags.